The holy grail of collecting music is coming across forgotten undiscovered gems that had lain in the vaults of record companies for decades. This collection is a classic example, and continues the Trapeze label strategy of working with artists to give their work the exposure it deserves. 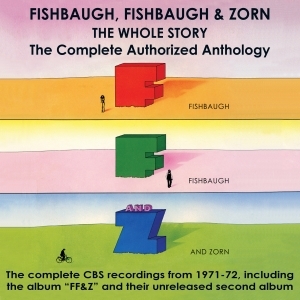 Fishbaugh, Fishbaugh and Zorn (husband and wife Paula and Gary Fishbaugh, plus Pete Zorn) were an American act that who came to the UK and signed with CBS – Gary and Pete had previously worked with the New Christy Minstrels. Their first album, produced by Junior Campbell and featuring top British musicians, came out in 1971 with considerable corporate noise, and the band toured with The Moody Blues and The Kinks, but the album didn’t do enough to keep the record company on their side and the second album was never released. An all-too-brief career stalled, and the band broke up, Pete Zorn staying in the UK to become a fixture on the electric folk scene, working with the likes of Steeleye Span and Fairport Convention, while Gary and Paula returned to the USA. Trapeze has put this anthology together, including a 16-page booklet, with the full co-operation and involvement of FF&Z, and it represents a fascinating, entertaining and exhilarating musical snapshot of the times. The music is very much of that era - arcadian Californian harmonies, evocative of CSN&Y and other great groups of the genre, and songs, all written by group members, that run the gamut from reflective folk through archetypal west coast airiness to raucous rock. It’s essential listening for lovers of rock curios that give another slant on one of the most exciting eras of music.